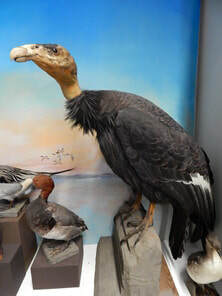 Cecile Clarke collected many taxidermied bird specimens from the local area. The star of our bird collection is Charlie, one the last two wild condors in Northern California (the other one is at Eureka High School). There is a major conservation effort currently underway by the Yurok Tribe to reintroduce condors to the area. ​They were once an vital part of the ecosystem, as well as being sacred to the Yurok, with important ties to their ceremonies.